Carta Geografica, Statistica e Postale Dell'Italia. 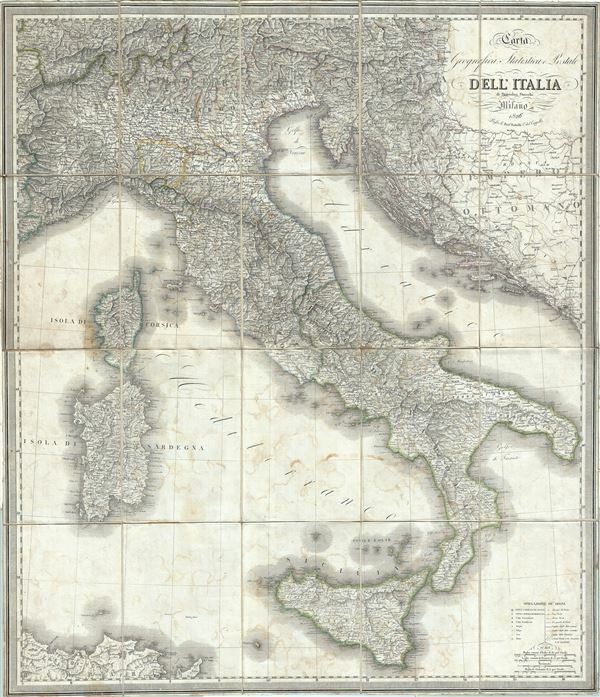 This is a stunning 1826 map of Italy by Stanislao Stucchi. It covers the entire Italian peninsula from Switzerland to Sicily and notes postal routes throughout the country. Towns, cities, rivers, forts, ruins, mountains and a host of additional topographical features are also noted. This period in the history of Italy saw the birth of the 'La Giovine Italia' Italian solidarity movement. In 1830 a series of insurrections throughout Italy lead to the adoption of the tricolore and nearly established a united Italian state. Unfortunately, in 1831, Pope Gregory XVI invited an Austrian army to help crush the insurrections, postponing the push for Italian solidarity until the Revolutions of 1848. This map was published in Milan in 1826. Very good. Dissected and mounted on linen. Linen shows minor wear along fold lines and is detached from map at places. Map exhibits offsetting throughout. Minor spotting at places.